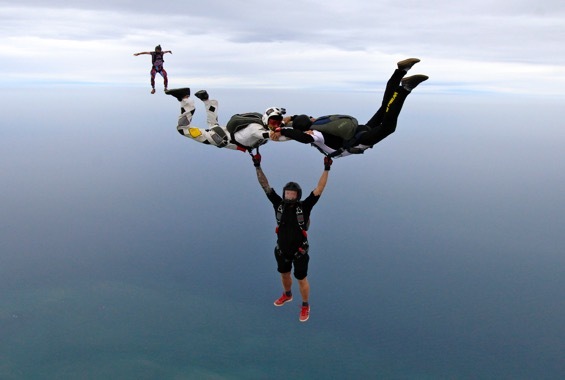 The jumps are mainly done onto the beach of the hotel where the participants reside. 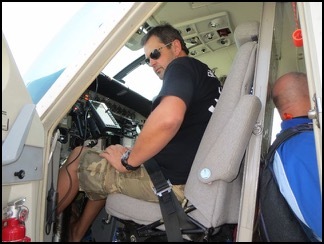 The plane used is a Cessna Grand Caravan with the "SuperVan 900 conversion" coming from Europe, equipped for skydivers and with a 900 CV turbine making it possible to ensure 4 rotations per hour. 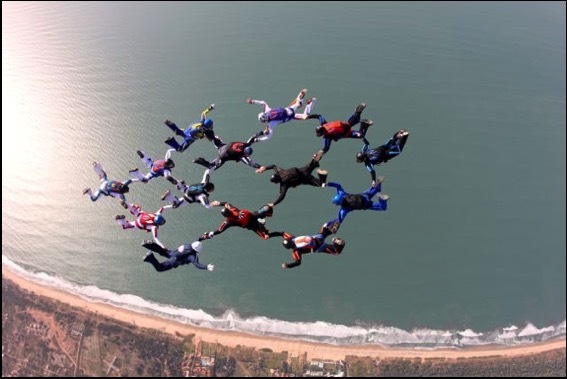 It is a great plane that carries 19 skydivers and it will allow each skydiver to make at least 5 jumps/day. Takeoffs will be made from Banjul International Airport. The route chosen will ensure the shuttles between the hotel and the airport are no more than 20 minutes. Other jumps are also done on many other beaches in front of luxury hotels, or on beaches where the local atmosphere is very authentic. There is also the famous evening "Paradise Beach", a secluded beach, with sunset jumps, hearty lobster, tiger prawn and fish BBQ, fire and dance under the stars. THE HOTEL, THE DZ FOR THE BOOGIE ! 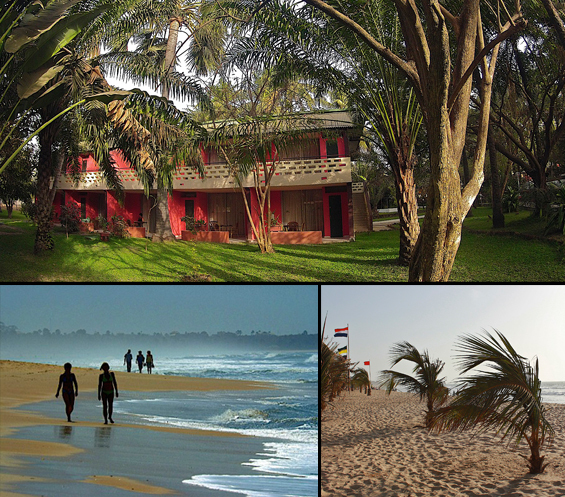 The Senegambia Beach Hotel offers a great setting with open, shaded and green surroundings. The very comfortable accommodation is distributed as blocks of 8 rooms in a very vast and luxuriant garden where, here and there, you will find monkeys, vultures and many bird species. The Senegambia Beach Hotel includes several bars and places to relax, two large swimming pools, a tennis court, volleyball court etc. The beach and ocean stretches as far as the eye can see in front of the hotel. With gentle waves and a temperature around 27 degrees, swimming in the sea is revitalizing. Senegambia Road is right at the doors of the hotel with all the adjacent streets having small shops, many restaurants, bars and everything necessary for a pleasant evening. 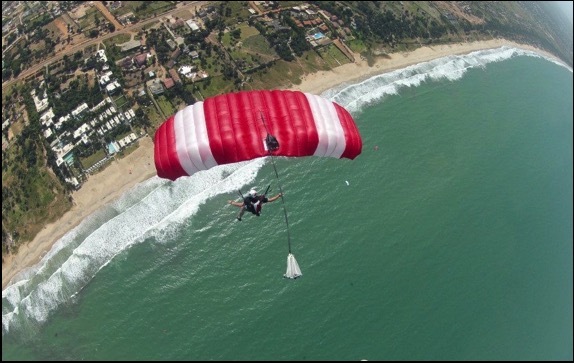 With a steady and consistently onshore wind which never blows extremely hard, the ‘jump’run’ and ‘exits’ will be parallel to the direction of the beach. 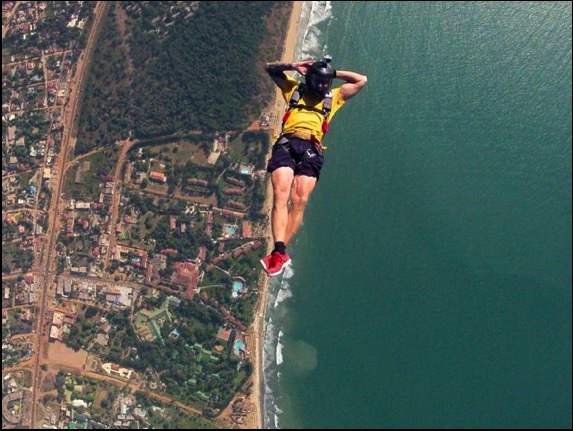 The jumps can be made above the sea in the comfort of knowing one will always have a favorable wind to bring the skydivers back towards the beach. The beach is immensely long and it offers sufficient places to land even with a high tide. 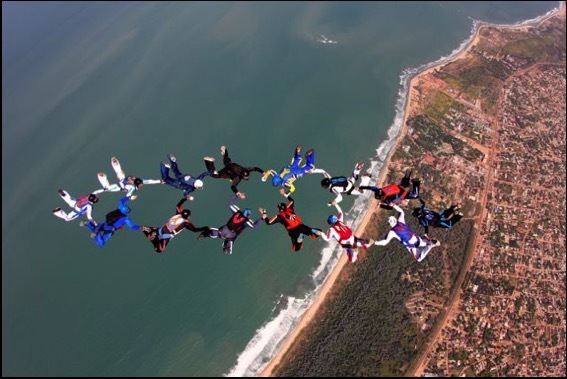 After landing, the skydivers return, via some steps, to the hotel surroundings, where they will find the packing area, manifest, space for briefing and debriefing all within 100 meters of each other. THE GAMBIA, A FANTASTIC COUNTRY ! Gambia is called “the country of the smile on the African continent”. English is the main spoken language. 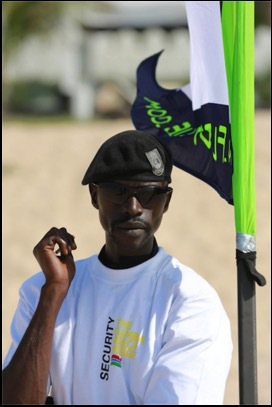 A little French is also spoken which is not surprising considering Senegal borders the country on each side. The Gambians are very approachable, genial, smiling and friendly. They love the tourists. It is a 'safe' country, which does not have any hostility. There are several social classes but there is no extreme poverty. No-one dies of hunger there. The Gambian countryside is fertile and there are colourful markets, gardens, culture, cattle and fishing. It is a country offering a tropical, but at the same time oceanic climate. The rainy season starts in July and finishes at the end of September but for the remainder of the year the sky is nearly always blue. With a temperature ranging from approximately 27 – 32 degrees and a light consistent breeze one never gets overheated, but one will definitely get a suntan! By tourist visitor standards, there is plenty to do. Nothing is overrated. 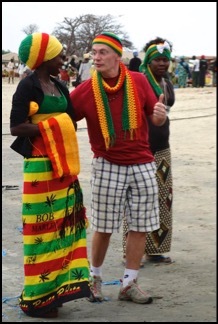 It allows the visitor to experience authentic local culture. AN EASY DESTINATION WITH BRUSSELS AIRLINES ! The Gambia is an easy destination because it is only 5 and 1/2 hours by direct flight from Europe and one hour time difference from Paris time. 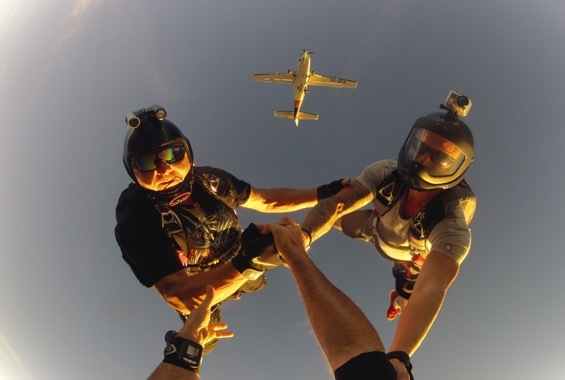 For this boogie, Skydive Discovery suggests you organize your flight with Brussels Airlines. 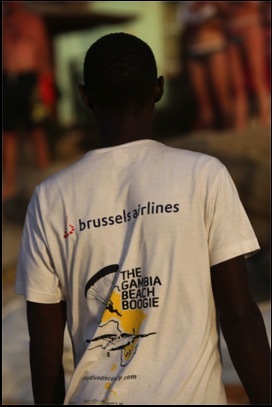 The departure from Brussels to The Gambia is at 11:30am. This allows easy connections with routes flown in the morning by Brussels Airlines from many major European cities. The flight make one stop in Dakar-Senegal and the arrival into Banjul International airport is at 18:30pm. A 20-minute bus ride will take you to the hotel. So, you can enjoy the end of the day and the evening. For the return trip, the schedules are just as good. The departure is at 20:45pm, so you don’t loose any time of the last day of the holiday and you arrive into Brussels early the following morning around 5:30am. 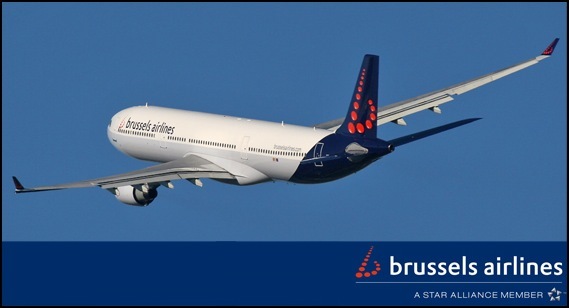 Brussels Airlines operates four flights per week, Monday, Wednesday, Friday and Saturday.